Projects are managed by these strategic development and planning teams and are involved in the day-to-day planning, decision-making and execution for steering projects towards implementation. The Global Poverty Team is made up of strategic advisers of various expertise spread across the globe, and a ground implementation team at the project levels in Ballia, Uttar Pradesh, India. Team members connect and communicate virtually, and on occasions meet face to face at the project level. The advisory team works in collaboration with the ground team to advance the agenda of farmers and women empowerment in sync with community empowerment and overall need for social, economic, and environmental sustainable development. A Ground Implementation Team (the farming stakeholders, owners and managers of the project) comprise of a dedicated group of college educated village youths, small farmers, large farmers, village leaders and advocates, women, women leaders, and experienced industry professionals (lawyers, economists, doctors, engineers, etc). The project provides a common platform for all to engage and support the common cause for development and poverty alleviation. The Ground Implementation Team in India, has been in existence since the project founding in April 2009 and comprise key impetus for the cause for poverty alleviation at the village level; the ground team works with the strategic purpose of building community relations and project confidence in India to advance the Vihar Poverty Project’s whole-system-design and beta-testing (in the field). 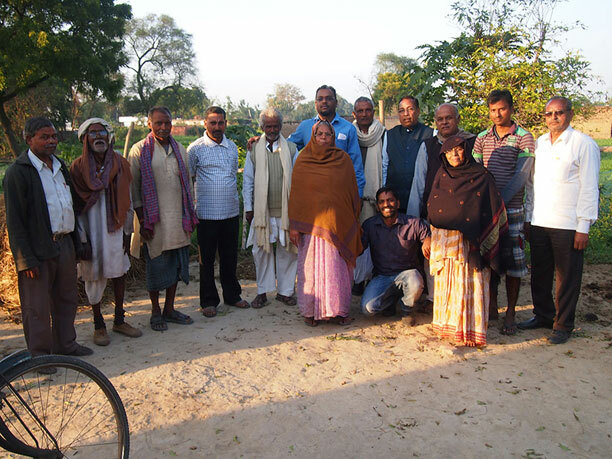 In Picture: Key members of the Ground Implementation Team of the Vihar Poverty Project, Ballia, Uttar Pradesh, India. Dennis Ramdahin, (center middle back); Vinod Tiwari, Ground Implementation Coordinator (stooping). The Super Energy Efficient Building Initiative for Climate Action (SEEBICATM) is a work-in-progress urban residential housing retrofit program (1-4 family) being designed to achieve scalable community energy efficiency and renewable energy in New York City. The project is being driven by Vihara Foundation’s Founder Dennis Ramdahin’s almost 15 years of work in building energy efficiency and renewable energy, and is geared to demonstrate the practical application of scalable building retrofitting in urban cities for achieving energy efficiency, renewable energy, and significant carbon emissions reduction. This project aims to achieve setting up a training institute in New York City, that would provide training of contractors and quality control inspectors to deliver state-of-the-art super energy efficient (at least 75 percent energy efficiency above base) to net-zero buildings for both retrofits and new construction. Considered the key research that gave the driving force to create the Vihara Foundation, research continues to be advanced to create a software tool using “Energy-Economic-Carbon Risk Management Financial Decision-making” in support of providing a simplified mechanism by which to valuate “energy efficiency investment risks” in large building and infrastructure projects. (TLCv is also being applied in the Vihar Poverty Project design to devise creative development financing policy for farming sector). Rock against PovertyTM (RaP) creative development fundraising drive is lead by a team comprising events management experts, music industry experts, business management strategists, and other stakeholders who believe in using the basis of the people to support the cause of planet and humanity. To date RaP has teamed with UNESCO NYS Chapter (2013-2014), has engaged the advisory of the Jimi Hendrix Foundation, and has teamed with Metavent (an Australia Technology Startup). This team is steered by RaP Founder Dennis Ramdahin, and comprise many others positioned in US, India, and Australia.